A great asset in front of your amp, whether you're a JoeBo fan or not. 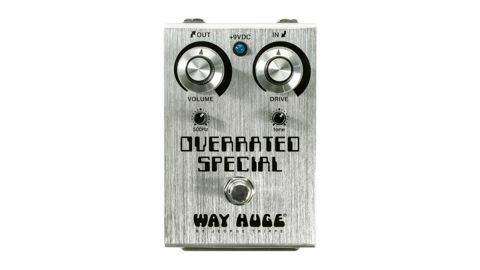 Designed for Joe Bonamassa, the Overrated Special is a limited-edition run of 1,000 units that reimagines Way Huge's Green Rhino overdrive. Designer Jeorge Tripps has tweaked the pedal for a more pronounced midrange and added a 500Hz knob that offers boost or cut around that low-mid frequency. an already overdriven amp to the next level, adding harmonics and helping notes bloom into feedback under your fingers. When used as a boost, the 500Hz knob adds a certain definition at a sweet spot that will let your guitar cut through the mix, while sounding natural rather than overly aggressive. It works just fine with a clean amp, too, giving you an extra channel of natural raunch to play with. Certain transparent overdrives have achieved mythical status by doing a similar job to this, give it a try - it's overrated in name only.